On a recent visit to San Francisco I was amazed at the number of Toyota Priuses on the road. I don’t think at any one time I could look in any direction on the highway or on city streets and not see one. It’s no wonder that the American auto market has been eclipsed by foreign auto makers, not the least of which is Toyota, riding the success wave of their gas-electric hybrid, the Prius. The Toyota Prius, unlike other hybrid cars, is only available in a hybrid version. So when you spot a Prius on the road, you automatically think hybrid and “that person cares about the environment.” This is in contrast to other, traditionally gas-powered cars that also offer hybrid versions. An example would be the Honda Civic. A great hybrid car, but the only thing giving away the fact that it’s a hybrid is a little icon on the back. Always the clean-air and environmental pioneer, at least amongst U.S. states, California paves the way again by giving people additional incentives beyond those offered by the federal government (tax rebates). In particular, hybrid cars are allowed to use the carpool lane. All hybrid cars? Nope, only those that actually live up to their billing. 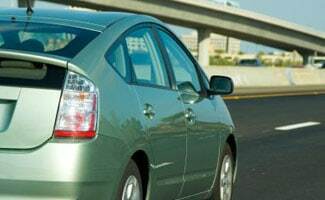 Hybrids allowed in carpool lane in California? Yes, but only those that achieve 45 mpg or higher. That would include the Toyota Prius, Honda Civic Hybrid, and Honda Insight. Rightly so – American manufactured hybrids achieve a mere fraction of the fuel economy gain that their Asian counterparts do. Are you ready to join the Toyota Prius Party? Alex loves nature and does his best to take care of the planet. He doesn't take for granted the serenity that can be found in the stillness of an ancient forest, or the majestic power of the ocean's large waves as they crash on an isolated island shoreline. He wants to raise awareness for how simple it can be to make a couple changes in your everyday life that can make a huge difference for the environment in the long term. Best Home EV Charger: JuiceBox vs ChargePoint Home & More! With the increase in gas prices over the last few years, many people are seriously starting to look for ways to use less gas. As one begins to ponder this problem with any type of serious thought, eventually they will turn to the option of buying a hybrid car. The, you will likely encounter the usual questions. One of the most popular hybrid cars right now is the Toyota Prius. These spiffy little models seem to just zip in and out and are seen everywhere on the highway today. However, how does is stand up when compared to other cars, hybrid or not? As far as cost considerations, the Prius is actually more expensive than the Toyota Camry. This is actually quite surprising, since the Camry has been one of the most popular Toyota models for quite some time. On the other hand, this model is one of the hybrid pioneers, already entering its third generation. Additionally, this model only comes as a hybrid. Another major factor to consider regarding a car is, obviously, the gas mileage. This model certainly does not disappoint in this area, coming in at 50 miles per gallon. The main reason for this is the ability to switch back and forth between battery power and gas power as the conditions dictate. Also, during periods of deceleration the electric motor actually begins recharging itself. Will the Toyota Prius actually save me money over the long run? This is the ultimate question. There have been a number of these kinds of analyses done over the last few years as gas prices have begun heading for the stratosphere. Right now, I found something on the internet which has captured my attention. It is a comparison of the Prius II with the Corolla. According to this evaluation, if gas prices average 3.50 per gallon, an owner would break even with the Prius after 142,000 miles. With gas prices at an average of 4.00 per gallon, you will break even after 124,000 miles. Is it a money saving proposition as the proponents of hybrid cars claim? Personally, it seems to me that it takes quite a long time before the costs will balance themselves out. I am not really interested in having to drive a car for over 120,000 miles just to break even. Combine this with the power factor and I think that this car does not really make good economic sense. Why should I pay more for a car which is much less powerful than almost anything else I could find for a comparative price? Plus, having to wait so long just to get my money back? I think that in the end, this is a highly personal decision. If you are interested in driving a Prius because you think it will help the planet, good for you. Many people think that driving such a car shows how much they care. Sounds good to me. I would just offer as a caution that they should expect to encounter much less power than they are probably used to and should not really expect to ultimately save any money due to the higher up front cost. One of the best investments someone can make today is driving a goo hybrid car. Probably the top model out there right now is the Toyota Prius. Many people who were excited with the idea of driving an electric car are even more enthralled with the chance to experience a hybrid version. They love the idea of a car that is intelligent enough to switch between electric and gas motors as the situation dictates. On the other hand, many of these folks were not likely expecting some of the compromises which would need to be made. For starters, they must get used to having a lot less power available. No more roar of the engine as they hit the gas pedal. No more screeching wheels as they punch it from a dead stop at a light or sign. Instead of having smooth horsepower and enough acceleration to blow other drivers off the road, you must change your expectations. Instead, hybrid drivers should focus on just how much power and acceleration is necessary. Certainly, the Prius will give you enough power to do any of the basic functions you need. You will be able to merge onto the highway from a dead stop. You will be able to pass other cars as required. Another great benefit of this car is that it will not overheat. If you have ever experienced this in a typical gas powered vehicle, you will understand this as being a huge benefit. Every time you stop, or slow below a certain speed, the gas engine will literally shut off. This also allows the batteries to recharge themselves. Obviously, an engine cannot overheat if it is off. Of course, another benefit is that it is good for the planet. Since the car burns much less gas, it does not contribute nearly as much carbon emissions. Many people feel good driving such a car, knowing that they are doing their part to help the environment and the planet. Another adjustment that some drivers will need to make is that of the noise. If you have been conditioned to hearing the moan of the engine as you punch it into overdrive or attempt to merge from a dead stop, then the Prius will be a big change. The operative word here is quiet. The car makes very little noise. Some people react differently to this than others. Personally, I have learned to love the quiet. Although I imagine a lot of people will have some difficulty with this, I now think the quiet is actually one of the best things about the new Prius. Admittedly, it does take a bit of getting used to. For those of whose only quiet time to themselves is their daily commute, than this lack of sound could be the perfect time to relax, unwind and actually spend some time thinking. The bottom line is that this car is a great investment. It is good for the planet and gets excellent mileage. Additionally, you can get used to the quiet. This article brings up something that kind of scares me. It is the part about how so many people drive the Toyota Prius and do so because they know people think that they automatically care about the environment. Now do not get me wrong, I do think it is admirable of people to spend extra money, sacrifice some comfort of a larger vehicle, and think conservatively about their transportation. But I also think that just as some people may lead awful lives and go to church every weekend, some people only care about the environment for as long as other people can see them do it. Out of sight of public eyes, they live just like the rest of us do, in wasteful bliss. The United States of America lives in unabashed and unapologetic wasteful glory. We throw out more than most countries actually need on a daily basis and we pay handsomely to do so. We also bear the cross of being as responsible if not more responsible for the global climate alteration than any other country on the planet. Given the opportunity, I truly believe that the American people would consume and devour everything the world had to offer just as long as it was conveniently delivered to their doorstep and they did not have to bother themselves with thoughts of where these things came from or what was done to get them. Now there are people out there who generally do care about the environment and they make conscious decisions every single day to ensure they are not leaving the place we live in worse shape than we found it. It is hard to soldier on like that, considering how much waste and filth there are where people are most prevalent. But then there are the people who do what is fashionable and popular in the eco-friendly crowd with no real knowledge or concern about what the issue at hand really is nor any care about whether anyone else does what they do, just that they know what they do. Who knows, maybe it is a necessary evil in the long run. The only way to get everyone on board with not continuing to kill our planet is to trick them into doing something that they will think is cool, but is really just a well designed plan to save everyone from themselves. Suppose we’ll just have to wait and see I guess.